Aside from being a celebration of xenophobia and misogyny, the Oscars also failed to pay tribute to Lupe Ontiveros and Russell Means. The six winners included three women, and all the winners are representative of a changing demographic: four are clearly students of color. One student, Hearin Ko, won a coveted spot by stating that she thinks “the film industry is ready for the next Asian film director,” adding that she wants to solidify magical realism as a recognized film genre. Fittingly, Ang Lee, who hails form Taiwan, won his second Oscar last night for Best Director for Life of Pi—a work that could qualify as magical realism. But most of last night’s Oscars magic stopped there, and was instead a lengthy celebration of xenophobia and misogyny. The song ended with an unnecessary backup from The Gay Men’s Chorus of Los Angeles. MacFarlane appeared compelled to explain that he’s not a member of the chorus—but Captain Kirk explained that in 2015, MacFarlane would, indeed, join the chorus. This indication that MacFarlane will come out of the closet annoyingly yielded a long laugh from the audience. Throughout the night, the audience appeared more offended by a joke about Abraham Lincoln’s killer 150 years ago than by MacFarlane’s racist, sexist and homophobic attacks against living people today. The remainder of the show remained stable ground for MacFarlane’s lazy hatred. But it’s not just what was said last night that was so offensive. It’s also what was missing. A long, moving tribute to major Hollywood contributors who were lost in 2012 failed to include Lupe Ontiveros and Russell Means. The award-winning Ontiveros appeared in some 150 acting roles in her lifetime. She was often cast as a maid, but worked to remind audiences that maids are also complex human beings. Her career paved the way for Latinas in Hollywood. Yet the Oscars seemed to forget that. Russell Means (Oglala Sioux) started his acting career in his fifties after a lifetime of political activism, perhaps most famously with the American Indian Movement. While some were, at times, disappointed with Means’s political decisions, it’s unacceptable that the Academy would obscure his vast contributions as a Native actor in the entertainment industry. The Academy had a chance to include Ontiveros and Means in their online tribute to those stars they couldn’t fit in the program last night. But neither Ontiveros nor Means is there. 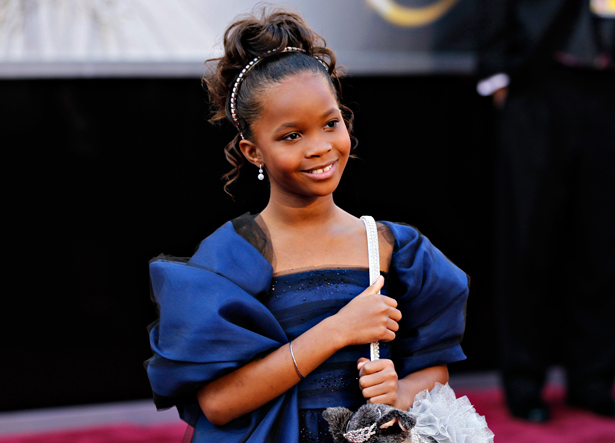 In one song during last night’s Oscars, MacFarlane crooned about Beasts of the Southern Wild, which he quipped “was made for fifty bucks, with a star whose name looks like a vision test.” MacFarlane was trying to be funny at the expense of 9-year-old African-American newcomer Quvenzhané Wallis, whose young age he also eerily referenced in terms of dating. Yet even this borderline pedophilic comment passed as acceptable—perhaps because the Twitterverse was busy debating whether it was acceptable for The Onion to call Wallis the c-word. The Oscars deliberately asked young people how they would contribute to the future of film and rewarded six of them. Wallis, meanwhile, wasn’t waiting for the future. At 9 years old, she has already arrived. The way the Academy treated her last night indicates that talented young women of color will be hazed on a world stage, while an audience of her supposed peers sits by and chuckles. MacFarlane equated Wallis’ name with a “vision test,” yet if he were the one whose eyes were being examined, he clearly failed to see the talent in front of him. With an average age of 62, the Academy remains 94 percent white and 77 percent male. Perhaps we should be asking ourselves if we expect anything different than last night’s horrible excuse for an awards show. Hundreds of workers from the Life of Pi visual effects team protested the ceremony over working conditions. Read Allison Kilkenny's take.